Sophie Steiert opens a bag of kosher gummy bears and offers them to 20 other German teenagers seated around her in their high school classroom. The students shrug. Most of the 17-year-olds never have met a Jewish person. In school, they’ve only talked about dead Jews: the 6 million killed by the Nazis. [post_ads]For years, the Jewish community in Germany relied on Holocaust survivors to be its ambassadors. Jews who made it through the horror were the ones with the moral authority to teach young Germans about the perils of anti-Semitism and the crimes of their forefathers. But with the number of survivors dwindling and schoolchildren today at least three generations removed from the Nazis, young Jews like Steiert are being tapped to put a modern take on an old message. 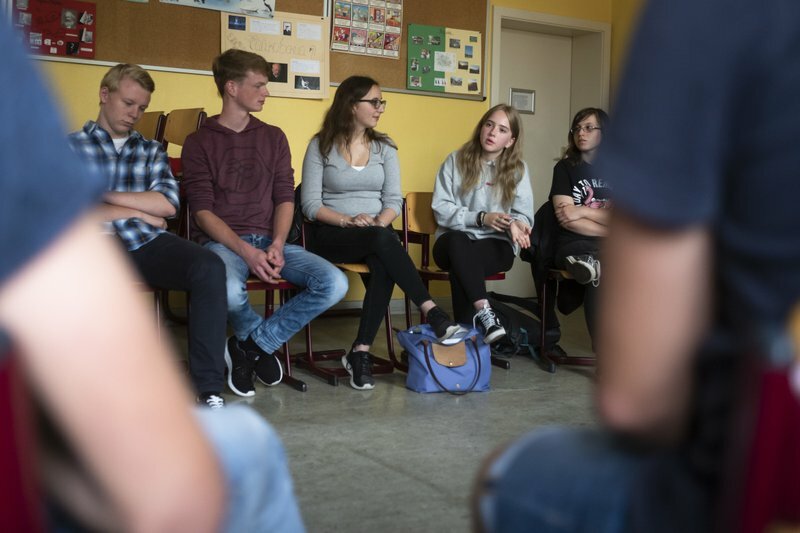 More than talking about the crimes of the past, they have been encouraged as volunteers for a school outreach program to focus on Jewish life in Germany today. The program was launched amid fresh concerns about anti-Semitism in schools and on the streets of German cities. Enter Steiert and her friend Laura Schulmann, two girls from Berlin who want to change perceptions and challenge stereotypes as their community’s 21st_century ambassadors. During a recent visit to Bohnstedt-Gymnasium high school in Luckau, a rural town nearly 100 kilometers (62 miles) south of Berlin, Sophie and Laura tried to approach the students’ lack of knowledge with easygoing openness. One teen raised his hand and shared he had once seen Jews while vacationing in Austria. They all were wearing black caftans, big hats and sidelocks, he said. Laura — dressed in jeans, a grey hoodie and sneakers — explained that the people he saw were ultra-Orthodox Jews adhering to strictly observant practices. She digressed briefly to cover what else very religious Jews do or don’t do, and ended up explaining that texting and everything else one might do with a smartphone are off-limits from sunset Friday until Saturday evening, if one observes the Jewish Sabbath, or Shabbat. As part of their training, the Jewish teenagers receive coaching on speaking in front of groups, talking about the Jewish faith and dealing with possible anti-Semitic reactions. Central Council of Jews President Josef Schuster said he thinks the likratinos project can be called a success after almost 80 presentations. He thinks it’s because Jewish and non-Jewish teenagers can relate at the same level. The only problem, he said, is there are more schools requesting workshops than Jewish youngsters to give them. Germany’s population of 82.8 million now includes only about 200,000 Jews. Berlin has the biggest concentration, about 40,000. Before Adolf Hitler and his Nazi Party came to power, Germany had a Jewish population of about 500,000. [post_ads_2]Most of the Jews now are immigrants from the former Soviet Union who were taken in after the Berlin Wall came down in 1989, a gesture of atonement for the Holocaust crimes of the Nazis. While anti-Semitism has existed in Europe for hundreds of years, often fanned by Christian churches that blamed Jews for the killing of Jesus, a large new influx of immigrants from Mideast countries into Germany has provided new sources of tension, such as the Israeli-Palestinian conflict, according to German officials and Jewish activists. The German Interior Ministry said in its annual crime statistics survey that police received reports of 1,453 anti-Semitic incidents in 2017— four per day. The visible reappearance in Germany of the prejudice that resulted in genocide has aroused alarm. Wenzel Michalski, the Germany director of Human Rights Watch, said his teenage son was harassed so much for being Jewish at a public high school in Berlin that he moved him to a private school. “Anti-Semitism has crept back into everyday life, and it’s shocking how much lethargy there is about this,” Michalski said. After a string of incidents, the brazen April assault in the German capital of a man wearing a yarmulke prompted demonstrations and a condemnation of the attack from Chancellor Angela Merkel. A 19-year-old Syrian who came to Germany in 2015 seeking asylum was identified as a suspect and convicted of serious bodily harm and slander and sentenced to four weeks in jail under juvenile sentencing laws. Sophie and Laura, who attend a Jewish high school in Berlin, said they have not had negative encounters as likratinos volunteers, but are careful in their day-to-day lives about revealing their Jewish identities. Back at the high school in Luckau, the girls told the class that their parents remind them constantly not to wear Star of David jewelry in public or anything else that might out them as Jews. After the lesson ended, Annika Wendt, 17, came forward to thank the speakers.